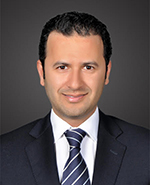 Waleed is Galapagos Partners' Strategic Partner – MENA Region, where he oversees investment opportunities as well assisting the Firm increase its geographic footprint internationally. Prior to joining Galapagos®, Waleed held positions with Kuwait Petroleum Corporation, a state owned company that integrated oil industry in Kuwait where he started as an Engineer within the International Marketing team among other management roles. He also worked for several privately owned companies in Kuwait involved in Logistics, Investments and Media. Waleed is an Undergraduate of Maine University with a bachelor of Mechanical Engineering, and the University of Kuwait with a Master’s in Business Administration. Waleed resides in Kuwait with his wife and two children.